The Youl family arrived in Tasmania in 1818, when John Youl (1773–1827), Congregational missionary in Tahiti turned Anglican clergyman, became the first chaplain in Port Dalrymple. The difficulties of running his large parish in a climate of moral laxity, as well as a chest ailment, led to despair, but he had some successes: the foundation stone of St John's church was laid in 1824, and he ministered to convicts and ran a school. Youl's land grant on the South Esk assisted his sons to become successful pastoralists. James (1811–1904) enlarged the Symmons Plains property and in 1854 retired to England, where he was the unpaid agent of the Tasmanian government. 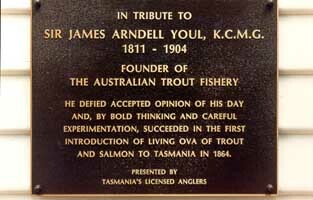 His most notable achievement was successfully introducing trout and salmon to Australia in 1864. Youl descendants still own Symmons Plains and other properties at Perth. Some have made their mark in sport: Simon Youl played tennis at Wimbledon and in Davis Cup teams, and John and Gavin Youl were well-known racing-car drivers. Symmons Plains is now the major site for Tasmanian motorcar racing. Further reading: ADB 2, 6, 12; P Blake, John Youl, [Launceston], 1994.